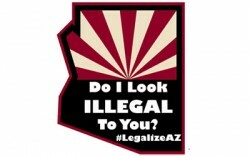 Despite what Governor Brewer says, racial profiling is officially legal in Arizona, given that there is no other way to determine what an undocumented person looks like beyond brown skin, which would serve as a proxy for criminality — the crime of not carrying proper identification and a birth certificate. And while the law is a slippery slope to losing more civil liberties, SB 1070 has gifted us with a great opportunity to organize for immigrant rights on a new scale. 1. Sign the email petition to your Congressional representatives, the Obama Administration and the Department of Homeland Security asking them not to cooperate with SB 1070, support any filed injunctions to the law, and, furthermore, start taking leadership in pushing for real comprehensive immigration reform. 3. Boycott, Divestment, and Sanctions. Rep Grijalva has called for an economic boycott of Arizona, which means not traveling to Arizona and avoiding the expenditure of any dollars in Arizona. The American Immigration Lawyers’ Association is already boycotting by canceling its annual conference in Scottsdale. Some truckers are boycotting. Others are asking the California Public Employees’ Retirement System (CalPERS) to divest from Arizona. More economic sanctions are likely to be announced in the coming week with a list of products and companies to boycott. The possibilities are endless. Consider this an open thread and invitation to share your ideas and actions. This is just the beginning.